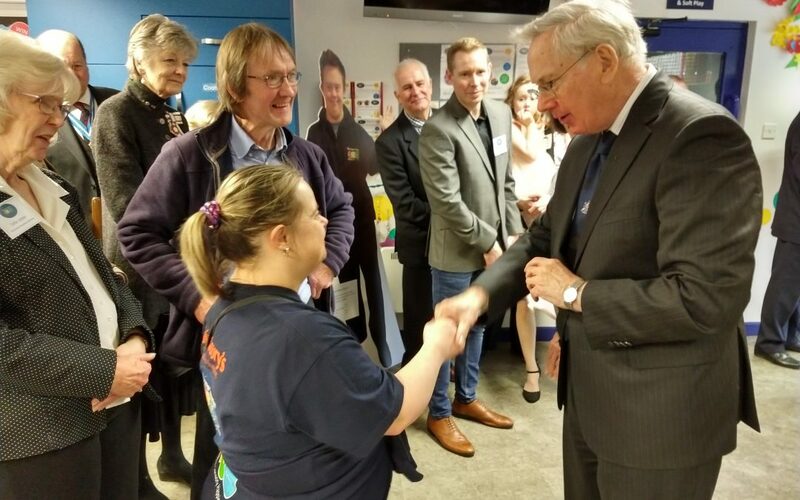 HRH The Duke of Gloucester KG GCVO visited Worcester Snoezelen on on Wednesday 6 February 2019. He unveiled a plaque to commemorate the 25th Anniversary Year of the Charity. The Duke was accompanied by the Vice Lord-Lieutenant of Worcestershire – The Hon Lady Morrison and the High Sheriff of Worcestershire – Cassian Roberts. Also in attendance were the Mayor of Worcester – Jabba Riaz, the Chairman of Worcestershire County Council – Councillor Brandon Clayton, and the Leader of Worcestershire County Council – Simon Geraghty, along with many other guests including supporters of the charity, staff and Members. Worcester Snoezelen is a leisure therapy centre for people with learning disabilities and additional needs, located in Turnpike Close, on the University of Worcester St John’s campus. It has four sensory ‘Snoezelen’ rooms, a hydro-therapy pool, sensory garden, and specialist music and creative arts departments.